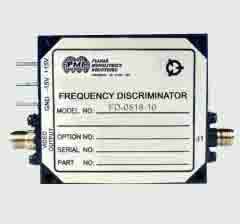 PMI offers a full line of RF and Microwave frequency discriminator products that range from a few MHz up to 40.0GHz. Many options are available. If you do not see exactly what you need, please e-mail your requirement to sales@pmi-rf.com so we can propose an instant solution. DFD-2G18G-5512 Active 2.0 to 18.0 GHz - 152 mm x 147 mm x 32.5 mm/ 5.98" x 5.79" x 1.28"
FD-0518-10-1218 Active 12 to 18 GHz 2.0:1 Maximum, 1.5:1 Typical 2.00" x 1.80" x 0.50"
FD-0518-10-3D1G3D5G Preliminary 3.1 to 3.5 GHz 2.0:1 Max., 1.5:1 typ. - Measured 1.68:1 Max. 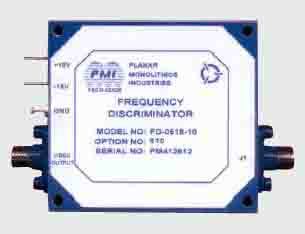 2.00" x 1.80" x 0.50"
FD-0518-10-610 Active 6.0 to 10.0 GHz 2.0:1 Maximum, 1.5:1 Typical 2.00" x 1.80" x 0.50"
FD-0518-10-618 Active 6.0 to 18.0 GHz 2.0:1 Maximum, 1.5:1 Typical 2.00"x 1.80" x 0.50"
FD-0518-10-812 Active 8 to 12 GHz 2.0:1 Maximum 1.5:1 Typical - Measured 1.44:1 2.00" x 1.80" x 0.50"
FD-1500M-500M-55-SFF Preliminary 1.5 GHz 2.0:1 max 2.5" x 1.0" x 0.4"
FD-1G-500M-55-SFF Preliminary 1.0 GHz 2.0:1 max 2.5" x 1.0" x 0.4"
FD-30M-6M-1515 Active 0.03 GHz 2.0:1 max. - Measured 1.09:1 4.625" x 1.50" x 0.47"
FD-30M-6M-1515-1 Active 0.03 GHz 2.0:1 max. - Measured ‹2.0:1 4.625" x 1.50" x 0.47"
FD-70M-50M-1212 Active 0.07 GHz 2.0:1 max. - Measured 1.1:1 4.625" x 1.50" x 0.47"
FD-0518-10-48 Active 4.0 To 8.0 GHz 2.0:1 Max, 1.5:1 Typ - Measured 1.19:1 2.00" x 1.80" x 0.50"
FD-0518-10-48-OPT3R5G5R5G Preliminary - 2.0:1 Max, 1.5:1 Typ 2.00" x 1.80" x 0.50"
FD-0518-10-2G4G Active 2.0 to 4.0 GHz 2.0:1 Max, 1.5:1 Typ 2.00" x 1.80" x 0.50"